I tried to integrate your code with my App but I do not see the error popup message like “User name should be 3 – 10 characters”. I only see the red icon. Can you please help? Thanks for the appreciation. I guess you forgot to set “presentInView” outlet, this is actually let the texfield know about where to show the error popup. Your code is working fine now. Can you tell me how can i display error after getting response from the API call? Still same error haunting me.. I could not fit it. Even though pch file is in the bundle, it gives me error to run the app. I have created a separate demo app with your code. I could run but validation is not happening. I don’t know where i am missing. Finally I could do it dhawaldawar by following this link http://stackoverflow.com/questions/25840720/xcode-6-pch-file-not-found . Thank you so much for your work. [self showErrorWithMsg:msg];//Calling this method for showing popup when user tries to enter text in textfield. When user clicks on image icon we are displaying popup with message. I need to implement exactly when user tries to enter text or when textfield is empty. Thank you. There is a data member “validateOnCharacterChanged” in TextFieldValidator class, you just need to set the value to YES. This will handle your case that you want. I have implemented validateOnCharacterChanged = YES. 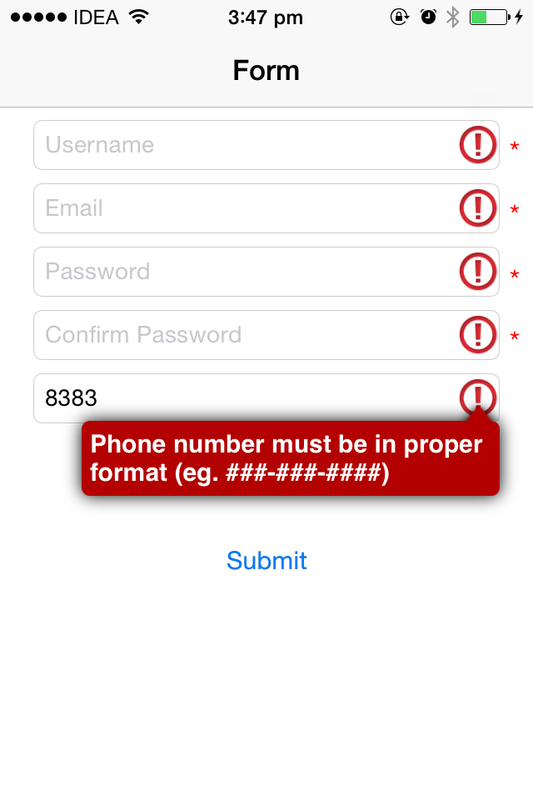 While entering text, validation is happening with message. But my problem is icon is not being displayed with message properly. I am not able to arrange popup exactly how we are displaying when user clicks on icon while entering text. Icon with message is being displayed differently while entering text. May be you haven’t set correct view to presentInView outlet, make sure that you are giving superview reference of TextField to this outlet. Hi dhawaldawar, first of all, great job! if you add up all the time we’ve saved you would become a millionaire. 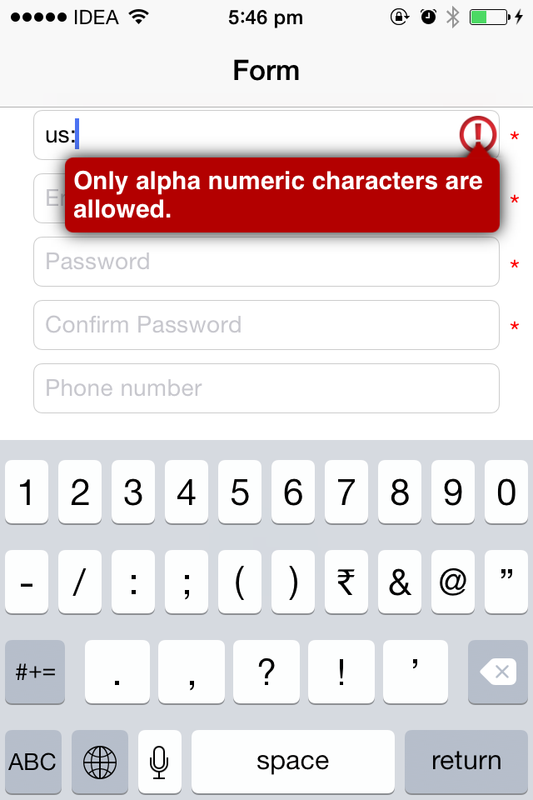 but it keep validating regex for VISA. i`m new in iOS, can you help me to know what i`m doing wrong? any advice? Well i have found a simple solution, added a public method to remove all regex..
is there any workaround to show all the error messages at once on click of submit button without the user having to tap on the red images one by one. You can make “showErrorWithMsg:” method public in the .h file so using this method you can show message directly for every text field. For which iOS version you are getting this error? Also please share some more information for that. Nice job,.. I implemented this nicely into my code. But I wanted to add checking of the database for an existing email. I get where it should be done, but I am not sure how I should test to find out if the TextValidator object that I have is for the Email field? Any suggestions? Hi, thank you very much for your appreciation. As I have not implemented code to handle validation externally but definitely you can handle this easily by doing some modification in the code. You just need to declare “showErrorIconForMsg” method in TextFieldValidator.h file which is responsible to show error icon and for hiding the error icon you can write new method that will set the rightView of textfield to nil. However, in my case I have some UITextFields within a Register Form in a ScrollView so Alerts are not shown correctly because UITextFields positions change. How can I resolve it? Can you please elaborate your scenario, as you said UITexfields position is changing so when alerts are creating problem either on tap of error icon or during some animation? Hi, This is great work but I want to add Textfield programmatically how can I connect TextFieldValidator class to TextField, please help me Thanks..
You don’t need to connect “TextFieldValidator” class to UITextField as this is inherited class of UITextField so you can use in the similar way as you create for UITextField, you just need to replace the class name by “TextFieldValidator”. You said it. 7.0 “and above” 🙂 thank you so much! is this available for ios8? Perfectly for my App – Thanks a lot! Thanks for this information dhalwaldawar.Great work. boundingRectWithSize for size(TextFieldValidator.m) is not working in ios6. I have made it for iOS7.0 or above only.